Massive rock formations reach for the sky in Arches National Park in Moab-Utah. Delicate Arch in Arches National Park in Moab is one of the park's most widely recognized formations. Tucked away from big cities and noisy interstates, Moab in southeast Utah is a magnet for those seeking stunning natural scenery and outdoor adventure. Two national parks beckon — one with massive rocks that rise up and reach for the sky and another with buttes and mesas that allow views of expansive canyons that change colors as the sun sails from East to West. Outdoor enthusiasts come for the hiking, whitewater rafting, kayaking, rock climbing, mountain biking, camping and off-roading. Festivals and events fill the calendar most of the year. There are enough interesting shops and restaurants to satisfy any appetite. This small resort town swells with tourists who come to play and gaze, but Moab doesn’t feel crowded. Maybe it’s because most visitors scoot out of town during the day to enjoy the great outdoors and other sights the area has to offer. And there’s plenty. Probably the biggest draw is Arches National Parkwith some 2,000 windowed arches, towering spires and hefty rock formations that seem to balance precariously on one another. The park contains the world’s largest concentration of natural sandstone arches, making it one of the best places to see amazing rocks. To get a better understanding of what’s ahead, stop at the visitor center at the park entrance, about five miles north of Moab. Then get ready as the road climbs up a steep cliff with several sharp switchbacks before it flattens out a bit. The 40-mile scenic drive through Arches offers overlooks, parking areas and trail access. Some of the formations can be walked to in a few minutes, allowing for easy up-close exploration. Others, such as Delicate Arch, the park’s most famous geologic feature, require a more strenuous hike. It is 1 1/2 miles from the parking lot. 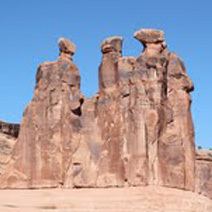 Even at a distance, these impressive formations dwarf visitors and cars. They are definitely stare-worthy. Both the park and campground are open year-round. About 35 miles northwest of Moab is Canyonlands National Park. No visit to Moab is complete without taking in this view. Canyons, cliffs and red earth seem to shift as shadows and light move across this vast landscape of sculpted rock. It has been described as a puzzle, a land that appears timeless and unchanging. The Green and Colorado Rivers sliced the canyons into four distinct districts with each offering different views and opportunities for sightseeing and adventure. Looking over the canyons makes you feel like you’re on top of the world. Most visitors drive through the area, stopping at overlooks and snapping pictures that really can’t capture the intricate details and vastness. Canyonlands is also known for its four-wheel drive vehicle and mountain bike routes, and white water rafting. This is Utah’s largest national park. Exploring all that it has to offer would take several days. Those with limited time should head to the Island in the Sky mesa. Every overlook offers a spectacular view. Canyonlands is open year-round. Each district has its own visitor center. The scenery in Canyonlands and Arches is breathtaking, but the paved roads probably aren’t heart-pumping enough for most off-road fans. The Moab area has hundreds of miles of old mining roads and 4×4 trails. No appropriate vehicle? Rent a jeep in town. Prefer two-wheel adventure? Rent a mountain bike and head out on the paved roads. Pick a route through Arches or pedal beyond. Other activities in the area include fishing, golfing, hiking, rafting and horseback riding. Moab offers plenty of overnight options including campgrounds, bed and breakfast inns, condos, hotels and motels, and campgrounds. Here’s a good reason to spend the night: Sunsets in the Arches are spectacular. Go to the Moab for the scenery. Go for the adventure. Both are thrilling. For more information, go online to discovermoab.com.